Most years I struggle with Easter Basket ideas and most years they are one of the last things I get around to buying because I’m never quite sure what to get. I want items that are inexpensive but I want to fill their baskets they will actually appreciate and won’t be broken, forgotten or destroyed by the end of spring break- I don’t need any more junk that will litter my house & My favourite part of Easter morning has always been searching for their Easter Basket. As a kid I love to discover what little treasures where hidden and nestled in there and now that I am a mom I love filling and watching my kids empty theirs. This time around, though, I find myself with the opposite problem – I’ve found too many great options. & While I struggle to narrow down my list, I thought I’d share it with you all in case you’re still in need of some ideas. You’ll find something for every kind of kid here (and some for the not so little ones in your life too) -Enjoy! 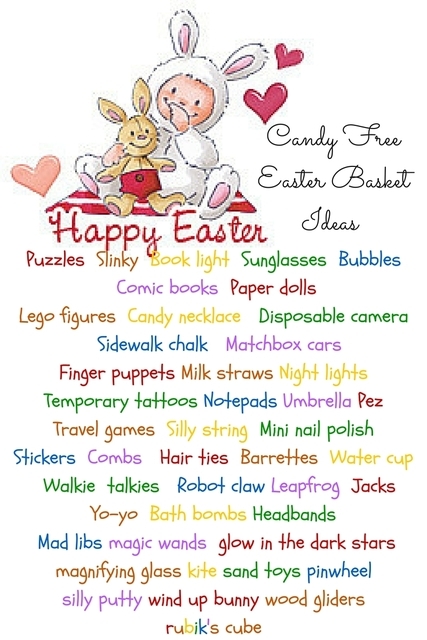 What kinds of things are your little ones going to find in their Easter Baskets this year? I would love to hear what your Easter plans are in the Comments below. « 25 Popcorn Recipes perfect for a quiet night in. Those are great ideas! My son loves getting books and new games and gift cards. Those ideas are great! I love putting a few non-candy items in my kid’s Easter Baskets every year. I like to give gifts other than candy whenever possible and you shared some good ideas here. Those are really great ideas! My kids love getting books and new games. You came up with SUCH goodies! I love the silly string, mad libs and tattoos! Now that is really sweet! My kids have their “own set” of dishes at their grandparents house too. They still have the set from the oldest and she just turned 21! My kids have food allergies that make most candy a no-no for them. Appreciate the suggestions for candy free Easter baskets. I can’t imagine how difficult it would be to try and work around food allergies. I try and find more candy free options only because I know that over time I am going to be the one who ends up eating most of their candy! lol!! 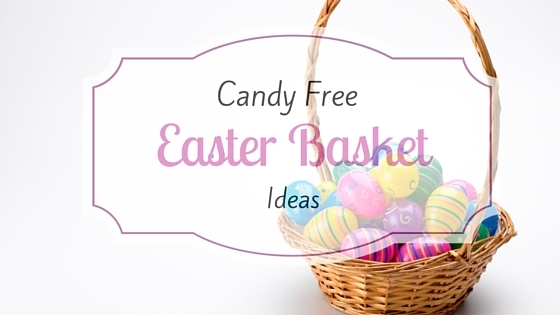 I think candy free baskets are a great idea. Some health conditions may prevent some kids from eating candy, or you may just want to get them something else! We always do candy free baskets- stuffed animal, organic snacks (that I use for their lunches anyways lol), books etc!